Artificial Intelligence and interconnectivity topped the buzzwords for tech giants heading into 2019, with the pursuit of smart-everything and ease of use being showcased at this year’s CES (Consumer Electronics Show) in Las Vegas, Nevada. The difference this year? It’s not just communications, automobile, software and robotics companies that are embracing this technology, but companies like Procter & Gamble and John Deere testing the waters. So why does this matter? Much of this has to do with the promise of 5G connectivity, which brought a big voice to the expo without much to show (this new connectivity tech will roll out throughout 2019), and the proposed improvement in telemetry and smart sensor connectivity. Basically, the step-up in connectivity will diminish latency issues and begin branching the gaps in rural areas that have plagued 4G networks, making accurate cloud-based data even more accessible for companies like John Deere. 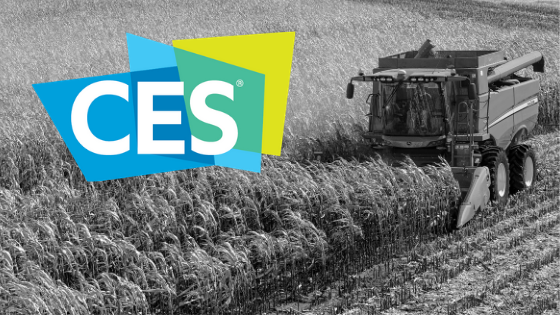 Their 1st time ever appearing at CES, Deere made a splash with a 20-ton Combine Harvester on the show floor and an automated tractor test on the back parking lot. They are heavily embedded in the introduction of this updated wireless network and premiered pieces of equipment that not only run by themselves but improve efficiency and waste management. The automated harvester is equipped with multiple external cameras utilizing computer vision and a precision AutoTrac GPS system that can identify predetermined routes and track the quality of grain, automatically adjusting kernel and separation settings. In the cab, you’ll find a layout similar to the rest of John Deere’s line of large agriculture equipment, with the added ability to monitor implements and set them to automatically adjust to terrain and quality, saving up to 10% of inputs in the process. This is a result of John Deere’s Intelligent Solutions Group and their focus on “precision ag”, where the automated systems are now accurate within 2.5 centimeters of execution and can deploy targeted herbicide, insecticide, and fertilizer, cutting the use of these chemicals by up to 90%. As a final benefit, farmers and equipment managers can also monitor the status of the piece of equipment from their phones, giving them readouts of the implements, live shots from the front camera placement and the ability to alter various aspects of the machine remotely. While much of CES is the announcement and display of concepts, this piece of John Deere equipment is already available on the market. Deere is currently looking to expand their team by bringing in AI and Robotics Pros to continue advancing their automated and tracking technology, displaying a dramatic shift in how long-standing companies are approaching experimental technology and taking steps toward the future. Check out Engadget's video to see the Autonomous 8370R Row Crop Tractor in action. Check out BeTerrific's video for an in-person run-through of the Automated Combine Harvester.